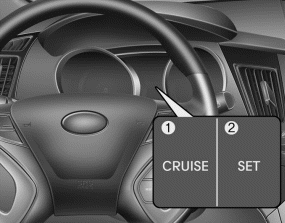 Be careful when driving downhill using the cruise control system, which may increase the vehicle speed. To activate cruise control, depress the brake pedal at least once after turning the ignition switch to the ON position or starting the engine. This is to check if the brake switch which is important part to cancel cruise control is in normal condition.